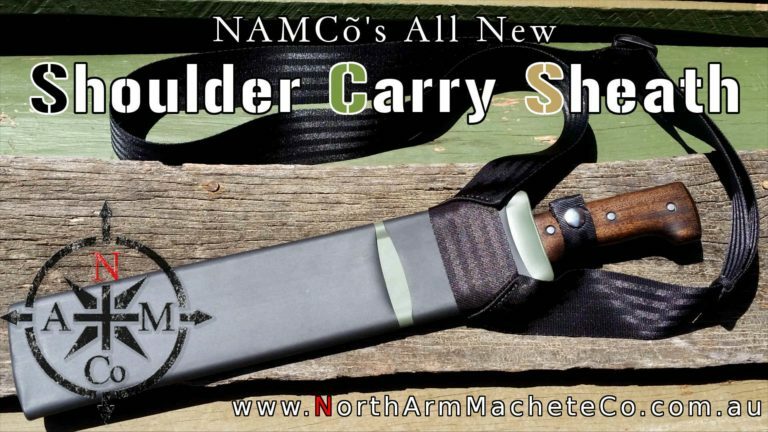 Home - North Arm Machete Co.
Why Develop a New Sheath System? Who we are at NAMCo. Full custom handle, extreme duty stablised hardwood ply, stainless steel flared tube rivet fasteners. Refined factory handle. Ergonomically contoured to fit with no hot spots. Stained with a distressed finish and coated in Danish Oil. 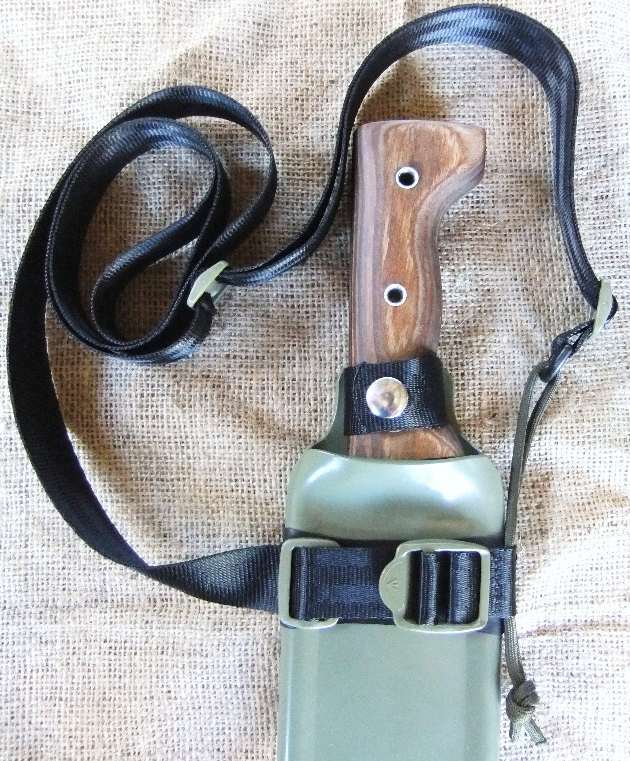 Quick action sheath. Ready for work! 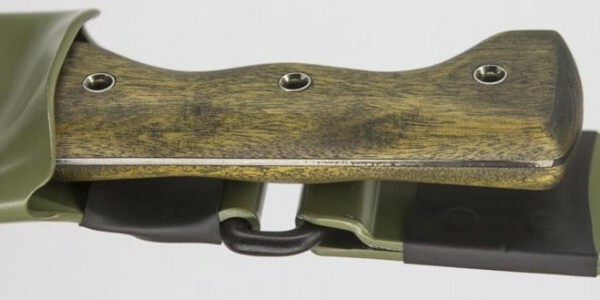 Handle modification examples. Left: Full custom 3D contour with tube rivets. Right: stock factory hardwood handle. Welcome to North Arm Machete Co. Here at the North Arm Machete Co., our goal is to provide 'Hard Work Tested' tools and information for Australians to see firsthand, how diverse the use of a properly sharpened machete can be. We have extensively field tested our sharpening and sheath systems as well as Tramontina's machetes in the harsh Australian environment. If your looking for a proper all day work machete, Tramontina really know how to build a workhorse. They have a huge following worldwide and we are happy to be among them. We tested so many brands of machetes and the Tramontina Bolo tops the lot. 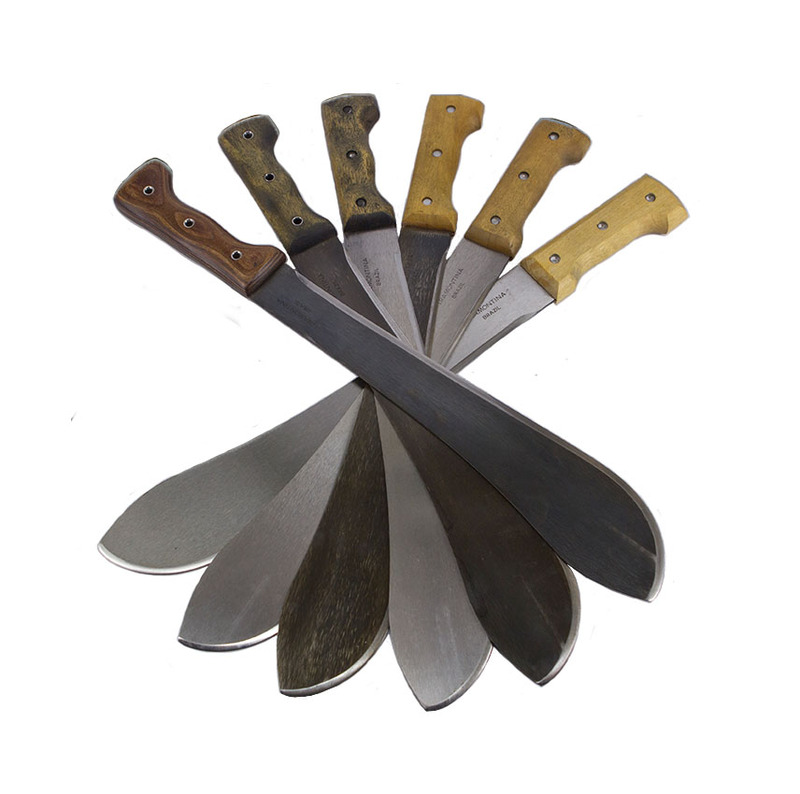 We have a lot of information on this site relevant for people who are new to machetes and sheaths. Where we live, we get to teach beginners how to use, sharpen and maintain machetes almost every week. Take a look around, if you have any questions, you can reach us via the Contact Us page. You might be asking how we field test these tools? That’s simple, we use them daily. Running our farm, tending to our kitchen garden and when we go bush, we use the same machetes and sheaths! We have been making and modifying high quality custom adventure gear now for many years. Machetes, knives and sheaths are something we know very well. We are introducing monthly specials. When we assemble these packages in bulk, we save and so do you. They are all for a limited time only. Click the picture on the right for a link to our Monthly Specials page. We are on YouTube! Here you will find lots of practical information on machetes that suits both beginners and pro's. Do you want to see how we use machetes down here in OZ? We have lots of new clips on the drawing board and will be releasing them when we find time between customising machetes for you all. Stay tuned for more updates. Click the pictures below for a link to our Machete Shop. Don't forget to have a look at our Shared Ideas Page for all the unique ways you can set these rigs up! Machetes are easy to customise! 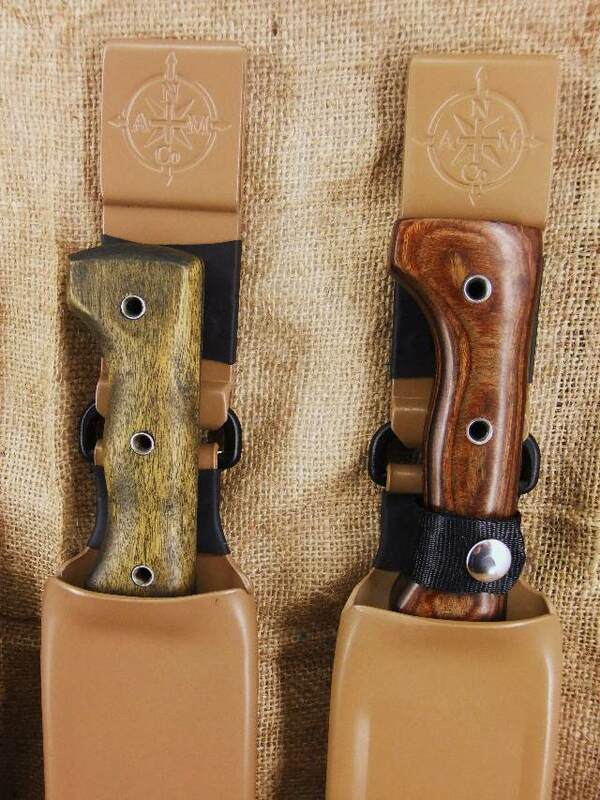 Why not have a Machete & Sheath setup exactly the way you want? Pick and choose which features are important to you and leave the rest out. To help get you started, we have come up with a simple 4 easy step process! The Tramontina 14" Bolo is clearly out in front!..... Why? Chances are if you have seen a machete or bush knife reviewed on line, we ordered it, put it through the ringer and work tested it! We have done the hard yards for you! The Tramontina 14" Bolo machete excelled in so many of our tests that we rewrote our selection criteria. The Tramontina Bolo is now the benchmark! We compared every other machete we had against it. The Bolo just could not be beaten! The Tramontina Bolo punches well above its weight! It's a proper all day work tool! If there was a better machete for the job, we would be using it. Take a look here to see why we chose the Bolo! There is no point in using a blunt or improperly sharpened tool. The Australian bush is harsh and unforgiving on any edge. 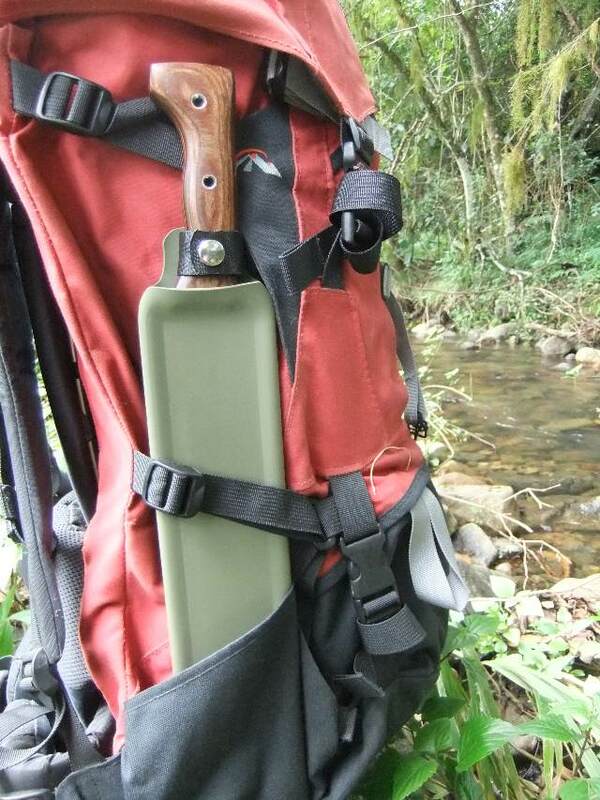 We know what it takes to put the right edge on a machete to suit our environment. How do we know this...? We don't just follow the retail trail of 'buying in bulk then sell online'. We use and rely on the same tools we sell. Know that when we sharpen your machete, you will get the best possible performance from your tool. Whether you want a machete sharpened as a bushcraft knife, you want a great garden tool or Lantana is blocking the path to your favourite campsite, we have it covered! Click here for a description on the 4 different styles of sharpening we offer. A good sheath is every bit as important as a great machete. They work together as a system. One major point of difference our sheaths offer is a single handed, quick 'draw and drop' action without clips and straps to undo. 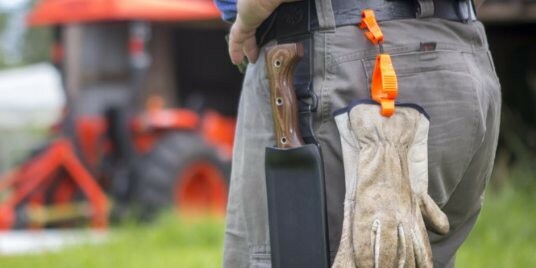 This feature is important for users who are constantly deploying and stowing the machete for work and is best taken advantage of when used with the Belt Hung Sheaths. For users who require the extra safety feature, we offer both the Backpack and Belt sheaths with a Retention Strap. 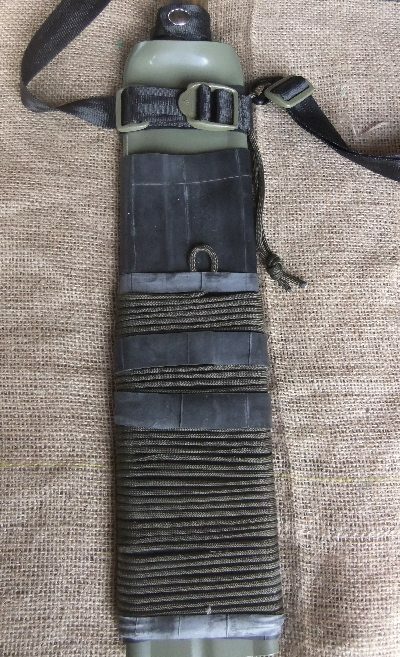 This strap helps secure the machete within the sheath. While canvas and leather sheaths may look good, they are no match when pitched against a properly sharpened machete. 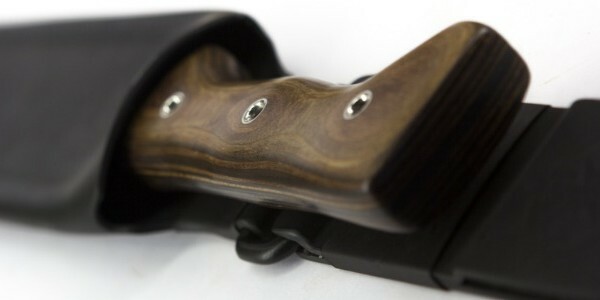 We have developed a sheath that offers a much higher level of durability compared to the more commonly used materials. Here is a good link to a nationwide product recall on a canvas sheath that failed. Take a look at our Machete Shop for the many sheaths we have on offer. We hand craft every one right here on the Mid North Coast, NSW. Because we make them from scratch, you get to pick exactly what you need and pay for nothing you don't! • Painting the sheath for a unique style and more.. Right out of the box, our hand sharpened machetes will get the job done. 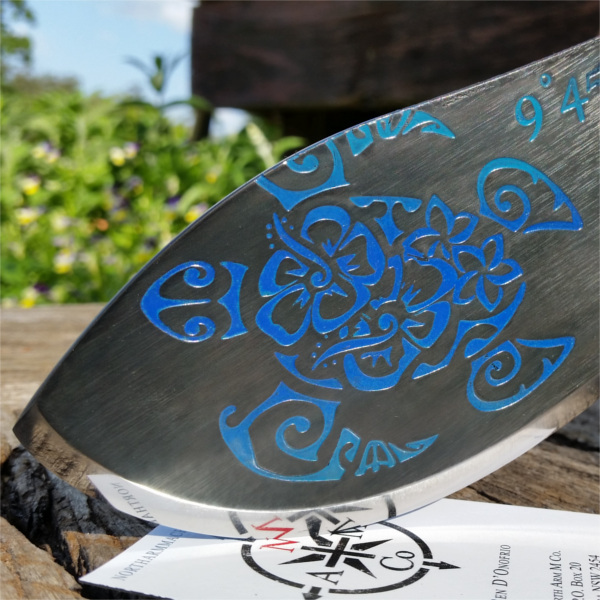 While we can customise the rest of the machete for you, if you want a great DIY project, simply check out our Product Info page to see how you can tailor your machete to suit your unique and personal style. Here is a link to our FAQ section on how we customise our machetes. Here is a link to the Machete Shop to get you on your way. © North Arm Machete Co. 2014-2020.